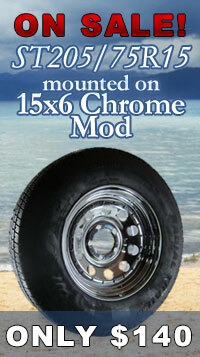 Cap Style 12" 6 lug on 5.5" wheel bolt pattern. Caliper bracket mounts to 5 bolt brake flange on your axle and fits inside 15" and larger wheels. E-Coated Caliper with 2-1/4" piston (stainless steel) is loaded with Ceramic Brake Pads that have Stainless Steel Clips for Extreme Performace, 50-100% longer life. Includes (2) Stainless Steel guide bolts with thread lock installed and (2) brass bleeder ports. More and more people are switching their trailers over to disc brakes, and with good reason. Disc brakes deliver consistent braking - even at highway speeds - unlike drum brakes, which often show a substantial drop in braking torque at higher speeds. 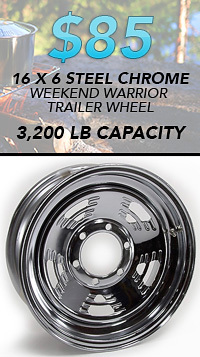 In addition, disc brakes offer a substantially shorter stopping distance than drum brakes. 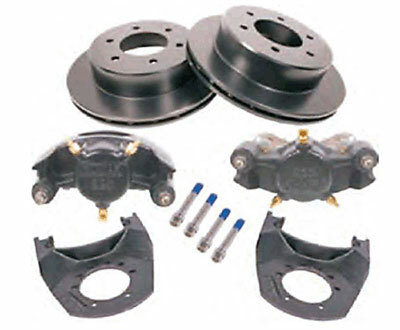 Disc brake calipers have only one moving part, rather than the many found in drum brakes. This means that there are fewer parts to maintain, fewer parts to get damaged and fewer parts to have to repair or replace, thus reducing maintenance costs. 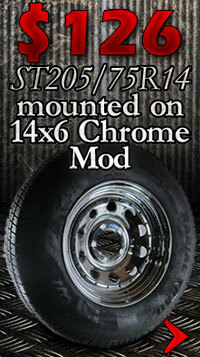 The over the hub style rotor is made from cast iron, matching SAE specifications. E-Coated Cast Iron is ideal for high-temperature operations and offers a favorable friction coefficient to ensure adequate stopping power. 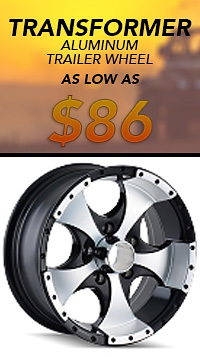 Kodiak's rotors are vented to effectively dissipate heat, dramatically reducing the incidence of heat-related damage. Kodiak calipers are constructed of E-Coated Cast steel to prevent flexing . Less flex means more braking torque, resulting in smooth, even braking every time. The corrosion-resistant stainless steel piston is 30 percent larger than standard pistons, ensuring shorter stopping distance and increased torque. In addition, the unique low-drag design of Kodiak's calipers allows the piston to retract farther than in most standard models, giving you a cooler-running brake. Designed for axles with 5-bolt brake flange configurations, the included mounting brackets are made of heavy-duty, corrosion-resistant E-Coated steel that is embossed to provide additional threading for guide bolts. The added thread strength ensures a tighter, more secure connection between the caliper and bracket. Another unique feature of Kodiak's brackets is the side-support angle, which guarantees that the load is carried by the bracket, rather than the bolts. Received in a timely manner, price was right. Assume it will work as advertised since it replaces like-for-like existing old calipers and rotors that were worn out beyond being able to be turned.